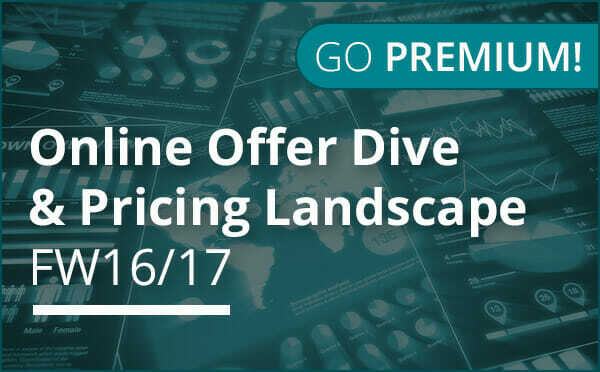 The 3rd edition of Online Offer Dive & Pricing Landscape FW16/17 is now available. Compiled by Contactlab and Exane BNP Paribas, the report looks at 32 luxury brands, comparing and evaluating the depth of the online offer as well as price positioning. The data from this year is also compared to that from the three previous editions of the report. A new trend is the rise in the purchase of certain items, such as glasses (+49%), watches (14%), backpacks and trainers, to the detriment of more traditional online products including jewellery (-15%), shoes (-11%), scarves and ties, which seem to have lost some online appeal. Though entrance and average prices have remained more or less the same for the panel as a whole, the price differences among the individual brands is considerable. The panel comprises 32 brands, the same as those in the new Digital Competitive Map 2017. The Standard Report, published in collaboration with Exane BNP Paribas, includes an overview of main research results. This year we have introduced the Premium version, which is a significant extension of the standard report published in collaboration with Exane BNP Paribas. If you buy the Premium Report you get an unique tool to understand and monitor the product offer and pricing architecture of 32 major players in the Fashion & Luxury industry, a precious support for crafting your own pricing strategy. Fill out the form to download an extract of the Premium Version of the report and get your hands on the key findings, some example tables and the full table of contents, which will all be accessible to you if you purchase the full report.